The once great metropolis of Swindon, nestling within the rural delights of Wiltshire, has fallen upon hard times. Even mighty Honda is having to lay off workers because of the general European malaise in new car sales. Travellers moving west and heading for the far distant holiday counties of Cornwall and Devon now pass by on the new-fangled M4 with scarcely a glance at the once mighty town. What’s to be done to return Swindon to its former glory? Well the first step is to buy more Civics obviously, but there are also ways by which the town can be enhanced through tourism. Nearby Oxford may have its dreaming spires but it also has some the ugliest buildings in the land. 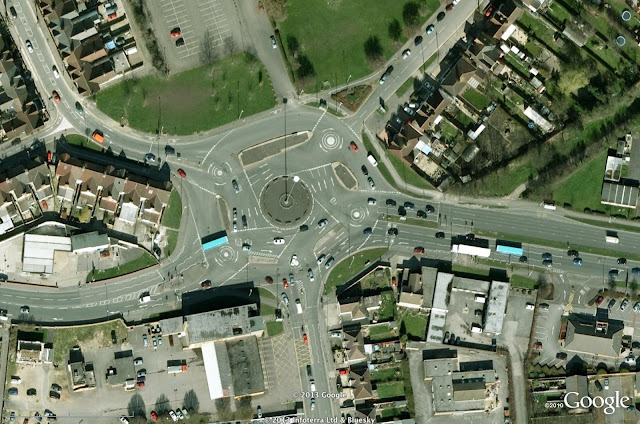 Swindon has much more to offer the passing motorist than you may have first thought. Not for nothing is it known as the town of traffic lights and roundabouts. Attention all driving enthusiasts who hanker for the joys of stop/start motoring - this is the ideal vacation destination. Swindon is also the first town in the land to switch off the notorious speed cameras thanks to a super-hero councillor - a man known to regularly wear his red pants outside his trousers, sometimes intentionally - and there was nothing that the hapless minions of the Department for Transport could do about it. Unfortunately the cameras have been replaced by irritating electronic warnings that, in the way of state sponsored signage, still manage to exude an holier-than-thou aura. The best, however, is yet to come because Swindon has a secret attraction known only to locals. Washington DC has its Lincoln Memorial, Agra its Taj Mahal, but they pale into insignificance against - the Magic Roundabout! This is a convoluted system of mini-roundabouts connecting five incoming roads and configured in such a way that whatever you try to do you will always be launched down entirely the wrong exit road. Alton Towers has nothing to touch it. Stephen Hawking visited once but couldn’t work it out and went home in a huff. Night-time ghost hunters will have a ball trying to spot the revenants of ancient motorists who never got off and were doomed forever to remain, turning and turning as they try to make it to Halfords. Set up your picnic apparatus on a handy verge and chuckle as red-faced shoppers trying to reach the malls of Greenbridge are thwarted at the last minute and find themselves halfway to Cirencester. How you’ll laugh when it happens to you. The answer of course is to hire a native guide for a small fee. You can tell them because they wear a lot of Burberry and sniff more than is usual. He or she will know which direction to take and which mini-lane to get in, thus avoiding the dangerous, penalty earning bus lane. Later they will nick your alloys but, frankly, it’s a small price to pay to escape the melee on the Magic Roundabout. So pack your bags and your kids and get yourself down to Swindon. Visit the Orbital Centre and gaze at the ancient ruins of an early Comet and a long lost Blockbuster encampment. Watch small herds of browsing locals grazing on pizza or texting whilst trying to park their Civics. Hours of fun and, of course, it’s all free. Don’t be a stranger! Have a happy holiday in Swindon - Gateway To The West. Just one word of caution though; when it is time to go always make sure you check for stowaways.